For this week's tablescape I decided to honor the 2nd most popular race at Churchill Downs, the Kentucky Oaks. Over 100,000 people attend last year's 135 Kentucky Oaks. 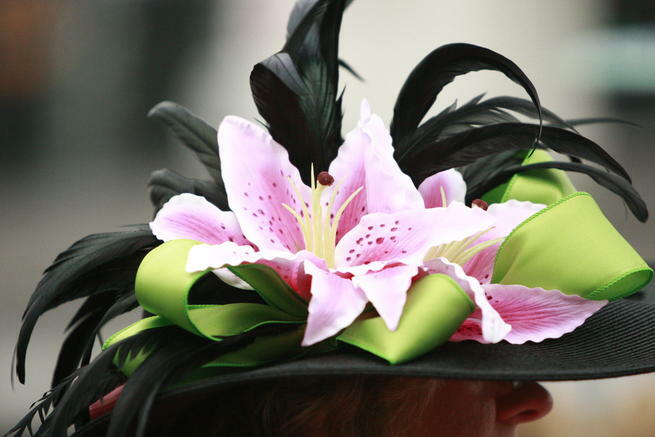 For those not familiar with derby week, the Oaks Day is traditionally the "locals" day. Most Derby tourists and celebrities are not yet in town for the big race and many Louisvillians meet up with friends, co-workers and old school mates to enjoy the race. From the website www.kentuckyderby.com "The Kentucky Derby’s sister event is as old as the “Run for the Roses” but features fillies and lilies and lots of things women love. In fact, women are such an important part of the Oaks experience that we’ve officially named the day “Ladies First.” Of course guys are welcome, too! In addition to a fantastic race card, highlighted by the 136th running of the Grade 1 Kentucky Oaks for 3-year-old fillies, we've got an afternoon of special activities planned for our female guests, from showing off your Oaks apparel to raising money for causes that matter to women." 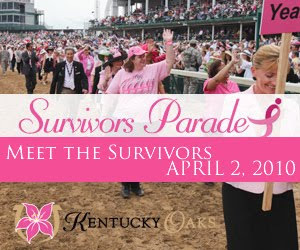 The Survivors Parade was first hosted by Churchill Downs for Kentucky Oaks 135 and featured 135 survivors. It was a joyous occasion to see the parade of survivors round the track before the race. The adopted color of the Kentucky Oaks is PINK in honor of the Oaks official flower, the stargazer lily, and the official color of breast cancer awareness is PINK. 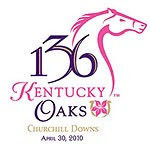 To connect the Oaks with its partner charities, Susan G. Komen for the Cure ® and Horses and Hope, Churchill Downs is asking you to THINK PINK when it comes to your attire for Kentucky Oaks 136! 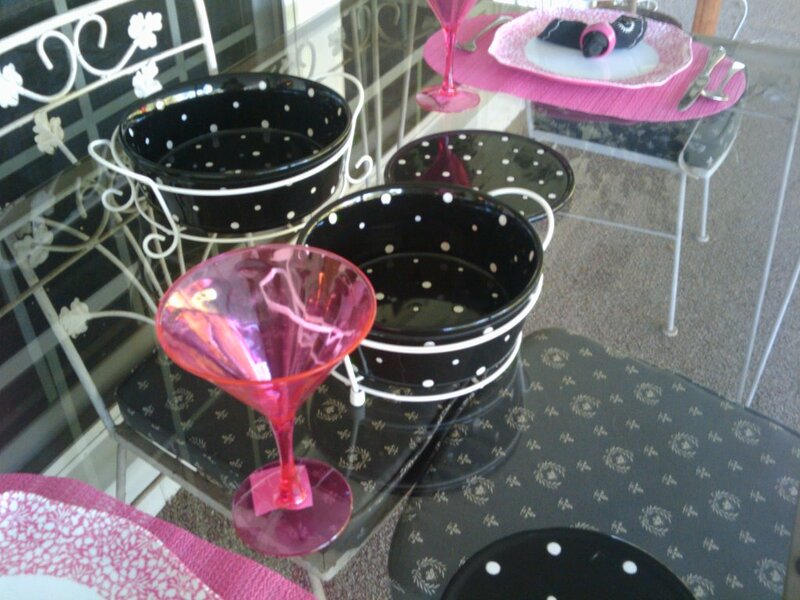 Please have a seat to join me for our own celebration of pink out. 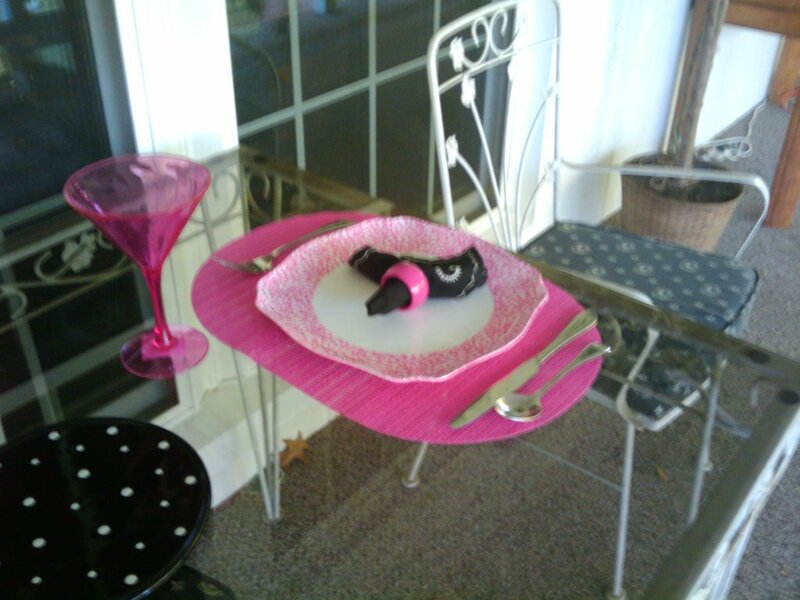 The plates, place mats, goblets and napkin rings are all hot pink. 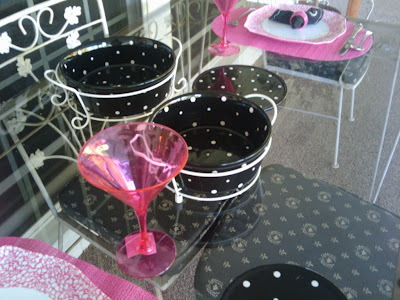 I used black and white dishes and napkins to complement the pink dishes. 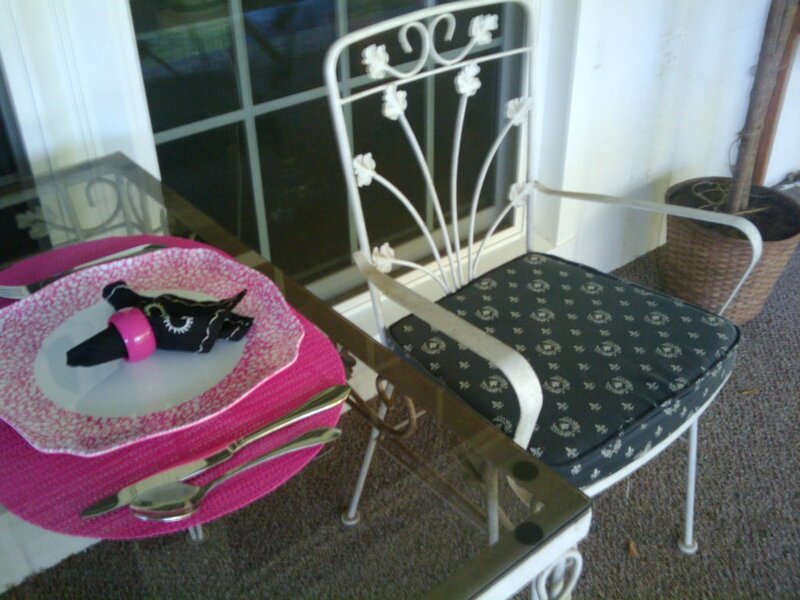 Here is your place setting ready for you to enjoy a spring meal on the porch. Thanks for stopping by to visit! Please join Susan at Between Naps on the Porch for more table settings. 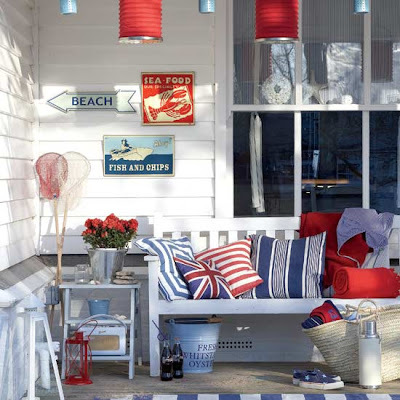 In my continued quest to decorate the wall of our porch I've posted these inspiration pictures I've found so far. This is very beachy nautical (above) from idealhome.com. Not so sure we're beachy people living in the heart of the bluegrass, but I like the vintage signs. 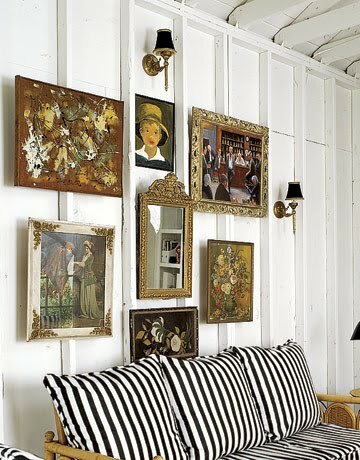 Believe it or not it was actually pretty hard to find images of porch walls as most photographs were from the porch out to the landscape. I like the one above from coastalliving.com because it shows a planter below the light fixture. That's a possibility for my porch. 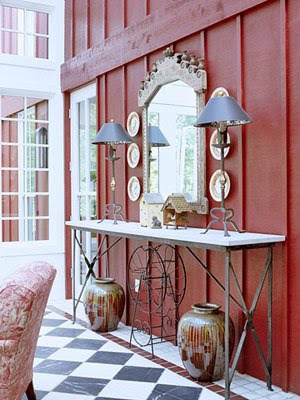 I like the mirror above the side table here - photo from coastalliving.com. 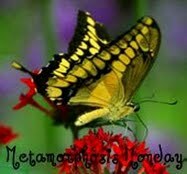 This maybe my favorite, but I'm not sure if it's the pictures or the black and white fabric (I'm easily distracted). This photo from countryliving.com is of both prints and mirrors. I could do plates and a mirror. I have plenty of plates! 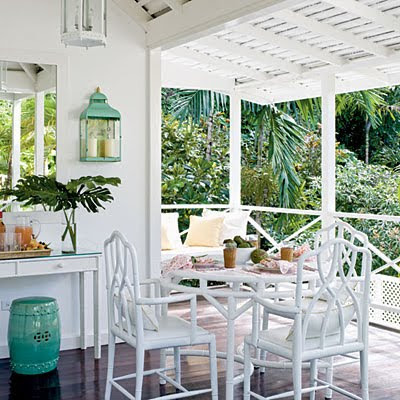 This photo is from Better Homes and Gardens. I love this floor too - focus people! 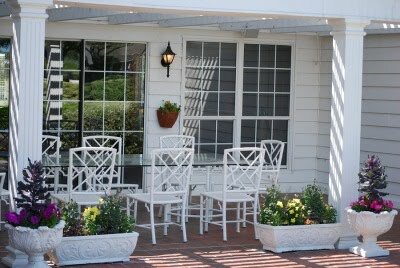 Finally I thought this porch looked most like mine with the white wicker and the white walls. The have used a round and square mirror treatment. This is from southernliving.com. I love the footstool! Well, I hope you've enjoyed looking at porch pictures. 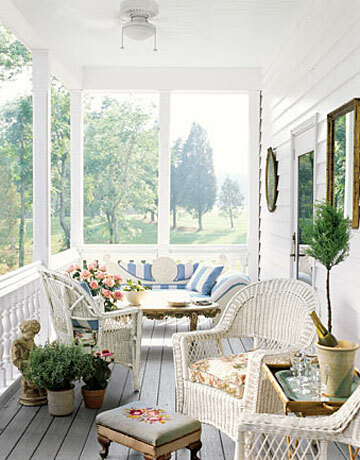 I could look at porches all day :) Stay tuned to see what I put on my porch. Madison says it's time to get back out on the porch and add some more details! Here's the sitting area in winter time. See nosy rosy peeking out into the yard? This area was pretty plain and boring! A few weeks ago I added the wreath and blue birds. But I wasn't totally happy with it, so I added a cake plate to the wreath and candle to increase the height. I placed a plant on the wicker table and some green pillows I found 1/2 off at Target on each chair. Then I added this pillow from the tv room. My Dad bought this for me at the State Fair a few years back. It's a Yellow Lab and a Westie! I still want to add some things around the plant on the wicker table, but I haven't found the right accents yet. On the wall behind the sitting area are two signs I got at Hobby Lobby last year. This needs something added to it but I'm torn between a mirror or pictures. What do you think would look good? Thanks for joining me today. 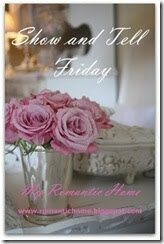 Please leave a comment before you go over to visit our hostess Susan at Between Naps on the Porch. 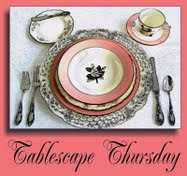 It's time for another Tablescape Thursday with Susan at Between Naps on the Porch. Where does the week go! Today I'm featuring a few things from my booth and a few things from my house that I thought would pull together well for a country theme tablescape. Here's a long shot with our ol' yellow lab Thunder observing the setup. He matches well with the red and yellow theme of the table! I used yellow dinner plates with a cotton red and yellow paisley place mat underneath. I love these rooster napkin rings. They are wood with hand painted touches. I like the way the red checked napkin pops against the yellow plate. Here is my rooster salt and peppers that match the cookie jar I set in the center of the table. This vintage rooster is filled with gerber daisies I saw at Whole Foods yesterday. I had already planned to use the red geraniums, but I couldn't resist the daisies too. Here's my cookie jar. I like that he's a color combination and not just one or two colors like most roosters. A birds eye view of the table. So apparently we do not get to have a beverage with this meal because I forgot the glasses! I was going to use a set of chunky glass tumblers that were my grandma's, but I guess I got too busy snapping pictures and forgot - sorry! Here we are a dusk. A long shot from the doorway to the patio. Remember these petunias from last week? I teased you Monday with a promise that they held a surprise. Well, last Wednesday night I sat out on my porch for an hour after dark waiting for the "surprise" which never happened. Ta Da! After some technical difficulty I now have the photos to show you the surprise - they light up at dusk. I think they look so pretty. I hope you enjoyed my country tablescape. Please join Susan to see more great ideas. Thanks for stopping by!